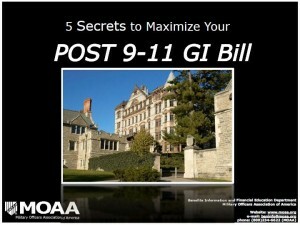 The Military Officers Association of America (MOAA) created an E-Book, “Five Simple Secrets to Maximizing Your Post 9-11 GI Bill Benefits” as an easy-to-use reference guide for the Post 9-11 GI Bill. Download a copy for yourself and your Soldiers here. The MOAA will also be conducted a one hour webinar on the in and outs of the bill on Tuesday, August 25th at 1200 Eastern.